I am pretty new to Hoboken and still exploring this side of the Hudson River. I moved here from NYC in October (just in time for Hurricane Sandy, yay!) and still struggle with saying “I live in New Jersey.” Plus, who wants to say they live in a place called “Hoboken?” Any self-respecting New Yorker will forever judge you for leaving their great city for the Garden State. 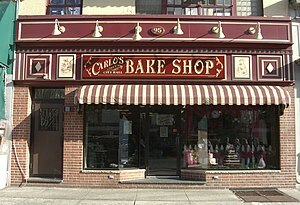 Ok, so now that I have that off my chest, I have to admit that Hoboken is a very fun city. “City” may be stretching it, given that its population is just over 50,000, but it still maintains an urban feel and provides easy access to Manhattan. Plus, I can still get my dry cleaning and dog food delivered, which is a godsend! 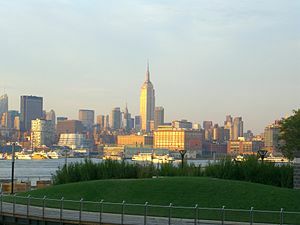 In addition, Hoboken is the home of baseball (the first organized baseball game was played here in 1846), Frank Sinatra, and the Cake Boss himself, Buddy Valastro. The beautiful views of New York are a very nice perk as well. Next time you’re in NYC, I highly recommend taking a trip to Hoboken. Once you get over the fact that you’ve crossed state borders (and in the middle of a river, no less), you’ll see why so many former New Yorkers have decided to make NJ home.